Living Online: Does Daytipper A Internet Scam? Does Daytipper A Internet Scam? 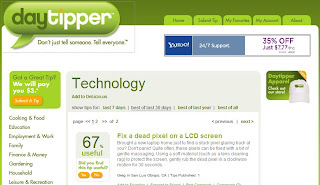 Daytipper is a simple social site that pays users $3 to submit a useful tip. Everyone can submit tips, if tips are published you will get money, and people can vote tips. I do not know more detail about this web service, but today I read an article that attracts my eyeballs "Daytipper - the Newest Internet Scam". It says Daytipper delay or did not pay writers for their tips, but got money from its ads. Does something wrong? Do you have tips of life? Maybe you need think about to post them by yourself on your blog.